English: From U.S. FAA AC 00-61, Chapter 6, Figure 41. Adiabatic warming of downward moving air produces the warm Chinook wind. 2007-01-19 23:07 Dhaluza 419×235×8 (26436 bytes) From U.S. FAA AC 00-61, Chapter 6, Figure 41. 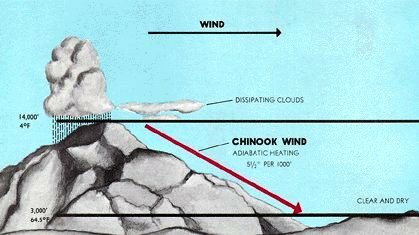 Adiabatic warming of downward moving air produces the warm Chinook wind.